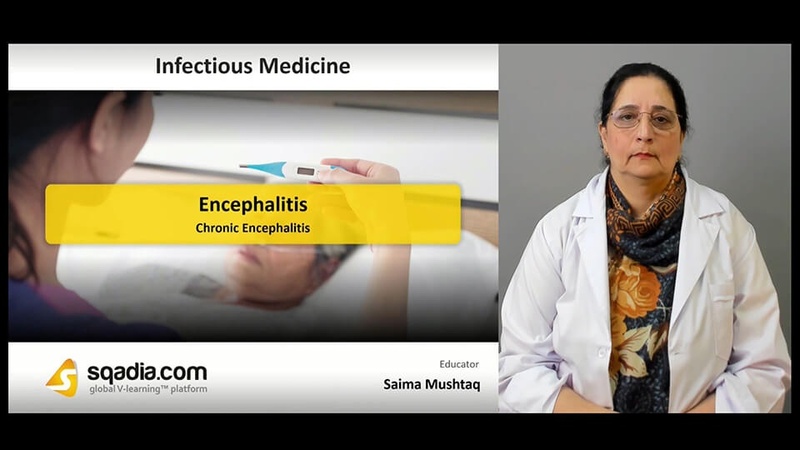 This sqadia.com medical video lecture focuses on all aspects of encephalitis. At first, clinical manifestations and etiology of encephalitis is discussed. Alongside, Dr. Saima Mushtaq enlightens the antiviral therapy. Then chronic encephalitis comes under consideration. Conclusively, comments are given on subacute sclerosing panencephalitis and progressive rubella panencephalitis. 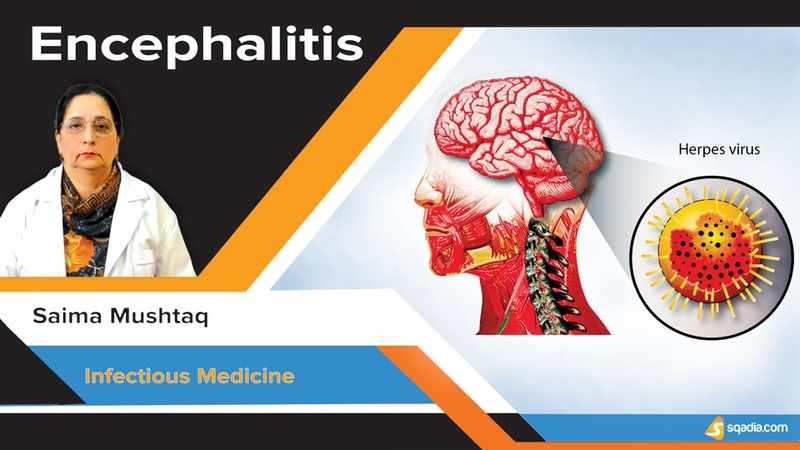 Patients with encephalitis are associated with meningitis. Clinical features include acute febrile illness, meningeal involvement, depressed level of consciousness, focal or diffuse neurologic signs, frankly psychotic state, focal neurologic disturbance. Some other clinical features are ataxia, cranial nerve deficits, temperature dysregulation, and diabetes insipidus. Aetiologically, herpes viruses, arboviruses, alpha viruses, flaviviruses, and Bunyaviruses are responsible. Initially, our medical specialist elaborates basic management and supportive therapy. Neonatal HSV CNS infection are Less responsive to acyclovir than HSV encephalitis in adults. Complications of therapy are elevations in blood urea nitrogen and creatinine, thrombocytopenia, and neurotoxicity. Then acyclovir resistance is discussed. Next comes the treatment through adjunctive IV glucocorticoids, and induction therapy. After that information about cidofovir, intravenous ribavirin, and treatment of WNV encephalitis is also pursued. Clinical features of chronic encephalitis are progressive multifocal leukoencephalopathy, multifocal areas of demyelination, and cytologic alterations in astrocytes and oligodendrocytes. Diagnostic studies of HIV-PML lesions, Immuno-modulatory drug associated PML, PML lesions, and pleocytosis is carried out. After that brain biopsy is carried out for definitive diagnosis of patients with negative CSF PCR. Serologic Studies are also described. Subacute sclerosing panencephalitis is a rare chronic, progressive demyelinating disease of the CNS. Signs on progression of this disease are intellectual deterioration, seizures, ataxia, and visual disturbances. Diagnostic studies include MRI, EEG, measles virus culturing, viral antigen identification, and viral genome detection. Progressive rubella panencephalitis is extremely rare disorder that primarily affects males. No therapy available for this disease. However, prevention via live attenuated rubella vaccine can be possible.